If you are considering adopting a more posture-friendly working position, but not sure if you want to take the plunge and invest in a standing desk, you need to consider a standing desk converter. With many options on the market and new products appearing online daily, our attention was grabbed by the iMovR Ziplift+ 35″ Standing Desk Converter and we only felt that it was fair to tell you all about it. The ZipLift+ is the latest iMovR standing desk converter that challenges the longstanding market champion, the Varidesk Pro Plus 36. It has a solid work surface, smooth height adjustment, and the ability to tilt the keyboard tray angle, so you can stay ergonomically sound whilst standing. At a similar price point, we wanted to see what all the fuss was about and understand if this product will now take the coveted top spot. *The ZipLift+ can support a combined weight of 35 lbs between the top work surface and the keyboard tray. However, the counterbalance force is set to 15 lbs. Please note that heavy dual monitors, or lightweight dual monitors attached to a dual monitor arm, would likely add more weight than the counterbalance force, and require additional lift effort from the user. This is similar to all other z-lift type standing desk converters. The keyboard tray conveniently tilts for perfect positioning, with a range of movement +10 to -15°. By reducing the bending of your wrists, you will reduce any potential for straining whilst typing standing. This simple feature is what also makes it more comfortable for taller users. Only about 5% of standing converter desks have the ability to adjust the keyboard angle, meaning this is quite a unique feature you won’t find on all products. Just make sure it is screwed tightly when in position so it doesn’t slip. To move the desk up and down there is a smooth and silent gas-strut enabled Z-lift mechanism with infinite stops that allow you to adjust the desk easily to your height preference. All that you need to do is simply squeeze clips located on either side of the gadget, and then release when you have it in your optimum position. It takes just seconds to switch from sit to stand and back again. And as is it pretty much silent, you do not have to worry about distracting others in your office whilst you transition from seated to standing. The generous work surface of 35.4″ x 15.7″ allows for pretty much all standard display setups, even 2 x 24” monitors or an Apple iMac, a monitor arm or a laptop. This helps you to keep working the way you like even while you stand, no modifications to your usual setup will be necessary. Also because the keyboard tray and top work-surface are separated on two different levels, it allows for the monitor(s) to be at a better ergonomic distance relative to the keyboard, and good wrist positioning whilst typing. 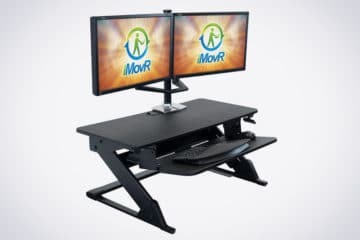 Monitor arms make positioning monitors easier, so you can find the most comfortable position and reduce any likelihood of neck and eye strain whether you’re sitting or standing. The good thing about the Ziplift+ is that it will accommodate practically any market standard monitor arm with the center grommet hole at the back and there is optimal space if you wish to use a clamp monitor arm also. You can also opt for a dual arm to use two monitors simultaneously for the best ergonomic fit. HINT: Monitor arms make an office desk far more ergonomic. Take a look a different types of monitor arms here. The Ziplift+ proves to be one of the most stable standing desk converters available. Even at full height, there is no shaking or wobbling whilst you type and they are sturdy during conversion even with 2 monitors are in play. The usual iMovR quality shines through and it’s an engineering wonder how such a lightweight desk can hold the same weight as most of the Z-type converters. Good for those who are DIY shy, the desk comes ready to use out of the box, with no setup or building. This is a pretty standard feature with most desk converters, but good to know and be sure before purchase. iMovR are at the top end of the price scale, but with that, you can expect a quality product, and this desk converter is no exception. It is priced very fairly making it a very smart purchase against some of the other “elite” converters that will set you back nearly one thousand dollars, and are in honesty, not that much better. Also sweetening the deal, they are currently offering a free-standing mat (valued at $50) with every sale, so now would be a great time to invest. Reaching just over 20”, the Ziplift+ is not the tallest desk converter on the market, but it’s definitely in the upper range and is ideal for someone as tall as 6”3’. The infinitely variable height adjustment isn’t limited to any preset stops, making it easy to find a comfortable standing position. Looking at our height chart for ergonomic standing desk heights, we can see that 20″ plus a standard desk of 29″ is sure to be a good fit for most users. If you only have a small desk, then this might not be the best option for you, the base measures 29.2″ wide by 22.2″ deep, so check the size of your current desk before purchasing. The ideal monitor height is 5 inches off your desk, but with the Ziplift+, in a sitting position, the lowest this will reach is 6 inches. This means that it may not be perfectly placed for anyone that sits low in their chair rather than straight upright. The warranty for the Zipift+ is 2 years, which seems standard, but on closer research, we found other competitive products can come with up to 10 years warranty. You will, however, as long as it is in mint condition, be able to return the product if not satisfied within 100 days from purchase, to secure a full refund, which is pretty generous. As with all z-frame standing desk converters, the frame will lift out towards the user as it moves vertically. This is not the worst factor and certainly not a deal-breaker, but definitely something worth considering if you work in confined spaces. You are going to find it hard to beat the Ziplift+. It ticks all the boxes on price, stability, ergonomics and most of all quality. With its smooth and sleek mechanism and fully adjustable settings, it’s got to be up there as one of the best, if not the best standing desk converters on the market today. We are going to score it a well deserved 4 out of 5 because on top of all the qualities and tiny drawbacks, we love the free anti-fatigue mat!